Female Eastern Bluebird (Sialia sialis) at the Montezuma National Wildlife Refuge near Seneca Falls, New York. Nikon D7100/80-400VR, 1/800s, f/5.6, ISO 640, EV +0.6, 400mm focal length (600mm DX). It was a windy, cold Spring day when I visited the Montezuma National Wildlife Refuge near Seneca Falls, New York last week. The Wildlife Drive was not completely open yet with a turn around and two way traffic on a normal one way drive around the Main Pool. Saw large flocks of migrating Redhead Ducks, red-winged blackbirds were staking out their territories, turkey vultures soaring overhead, Canada geese milling about, a Bald Eagle hunting near the river and other small songbirds singing. No sign of Song Sparrows, yet. While walking on the observation deck at the Visitor Center, a streak of blue flew past me and landed on the corner of the deck’s wood fence. 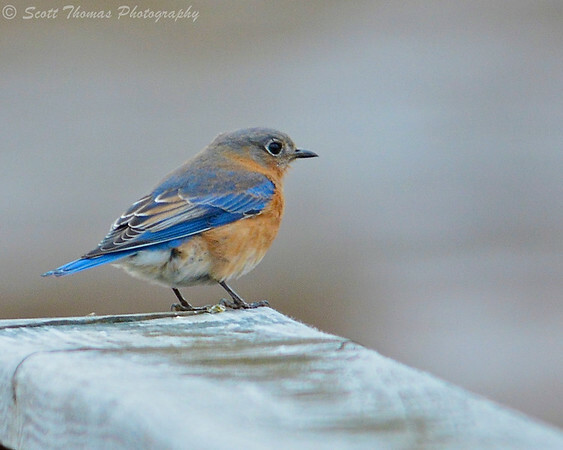 The female Eastern Bluebird (Sialia sialis) stood still long enough for me to get a couple of photos before flying off. A male was nearby, staying out of range of my camera no matter how long I waited. This entry was posted in Animals and tagged 80-400mm, birds, bokeh, eastern bluebird, female, montezuma national wildlife refuge, new york, nikon D7100, outdoors, seneca falls, sialia sialis, spring, vr, wildlife. Bookmark the permalink. Great shot you’ve captured of this beautiful bird, Scott.